Courage to Refuse is a collaborative project based on the mediation, through text, graphics, sound and video, of a manifesto called 'The Combatant's Letter', written by the Courage to Refuse movement in Israel. The movement concerns Israeli officers and soldiers who refuse to participate in, or to carry out operations beyond the borders of Israel, (in what is more commonly referred to as the Occupied Territories). As with most of Shane Cullen’s projects, this commission is based on the re-presention of a potentially loaded document, presenting a complexity of view points and an Israeli voice rarely heard or disseminated in the mass media’s portrayal of Israeli society. The commission comprises three 5 metres x 10 metres outdoor banners displaying the manifesto of the movement in prominent city centre locations, (translated into in Polish, German and Irish), a projection and sound installation in the National Sculpture Factory (7-9th July) combining a video projection and texts and an in-depth discussion (9th July at 3pm) featuring a presentation by Tom Mehager, a representative of the Courage to Refuse movement, Eamonn McCann, (journalist and political commentator), Anne McGeeney (Director of the Cross border centre at Dundalk Institute of Technology), Michael Kearney (Irish Centre for Human Rights), and moderated by Cork Caucus Curators Charles Esche and Annie Fletcher. All three artists collaborating on Courage to Refuse are affiliated to the ‘Culture and Conflict Group’. This project is funded by the Arts Council’s Commissions scheme and Cork 2005. With thanks also to Murray O’Laoire architects, Michael Roche, DHL, Declan Friel, Boots, George Burns, Peter Auf der Hyde, Print and Display and Ronan Devlin. Further information through the Cork Caucus Centre, tel. : (00353) 21 4323249 or the National Sculpture Factory, tel. : (00353) 21 4314353. The National Sculpture Factory is generously supported by the Arts Council, FÁS and Cork City Council. As part of Cork Caucus, The National Sculpture Factory has commissioned artist Shane Cullen to develop a project entitled Courage to Refuse. Shane’s project, which is concerned with a group of Israeli officers and soldiers who call themselves ‘Courage to Refuse’, is based on the mediation, through text, graphics and mixed media, of a manifesto called 'The Combatant's Letter'. The ‘Courage to Refuse’ soldiers refuse to participate in or to carry out operations beyond the borders of Israel, (in what is more commonly referred to as the Occupied Territories). In keeping with Cork Caucus and Shane Cullen’s other projects, a key part of Courage to Refuse will involve discussion and debate, led by a presentation from a key representative of the ‘Courage to Refuse’ movement, on Saturday 9th July during a group discussion from 3.00 pm – 5.00 pm. The installation will run in The National Sculpture Factory, Albert Road, Cork from Thursday 7th July until Saturday 9th July, 2005 from 11.00am – 9.00pm. 'The Combatant's Letter' declaims and represents the moral and philosophical position of a growing movement within the Israeli Defence Forces, (now numbering over 600). These soldiers believe that the military presence of the Israeli Defence Forces, who have occupied these territories since 1967, is illegal. They also feel that it fundamentally threatens and corrupts the moral foundation of the State of Israel, ultimately jeopardising its very existence. As with most of Shane Cullen’s projects, this commission is based on the re-contextualising and re-presenting of a potentially politically loaded document. This project hopes to present the complexity and point of view of an Israeli voice that is rarely heard, (as against the mass media’s portrayal of Israeli society as politically monolithic and culturally homogeneous). The commission will be comprised of three parts. Part one will consist of two 5 metre x 10 metre outdoor banners, which will display the manifesto of the movement in prominent city centre locations, (translated into Polish and English). Part two will consist of a cross–disciplinary installation in the National Sculpture Factory (from 7th-9th July, 2005), combining sound installation, video projection, texts and discussion. The project will culminate with a debate by a key representative of the ‘Courage to Refuse’ movement. The artist has invited two of his colleagues, John Buckley and David Crawforth, whose work combines mixed media, sound and video, to participate in and contribute to this event. All artists have previously been associated with the Culture and Conflict Group. Courage to Refuse is an important part of the National Sculpture Factory’s artists commissioning programme, but also forms part of its Cork Caucus programme for 2005. Caucus aims to investigate how art can contribute to critical discourse in Cork, but also (as curator Charles Esche has said) hopes to look at “the relationship between art and democratic development” and “the problems we now have with imagining new forms of collective decision-making and collective action”. By introducing socially and politically motivated disussion into an art context, Courage to Refuse aims to disclaim the views some Westerners have on the Middle East, as well as promoting freedom of expression and arousing curiosity in the public consciousness. Discussion: The National Sculpture Factory, Albert Road, Cork, 3.00 pm – 5.30 pm, Saturday 9th July: Discussion in the National Sculpture Factory. Please note that as places are limited, booking is essential. To book tickets please contact Elma O’Donovan on 021 431 4353, or contact elma@nationalsculpturefactory.com. The first manifestation of this work took place at Gallery 400, Chicago, as part of the exhibition ‘Settlement’ organised by the Culture and Conflict Group in the Winter of 2002. This was a group exhibition of politically engaged work by Irish, Israeli and Palestinian artists drawing parallels between the situation in Ireland/Northern Ireland and Israel/Palestine. As part of the presentation which the artists made, a member of the group, Major.Stav Adivi, was invited to address the public at the launch of the exhibition. This exhibition then toured to Ireland and the work with Courage to Refuse was shown in Derry at the Pilots Row Community Centre and as the visual arts component of the Cuairt Literary Festival in Galway 2003. The next manifestation took place in the Autumn of the same year at the Rialto Santambrogio in Rome as part of the exhibition ‘Think Over’ curated by Brian Kennedy. 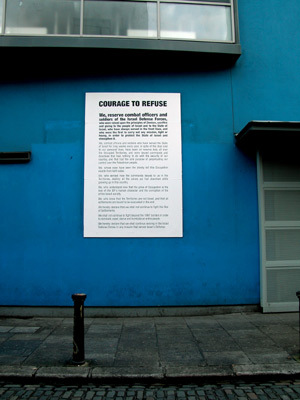 In the Winter of the same year the manifesto of Courage to Refuse was hand painted as a site-specific performative event on the exterior of Project Arts Centre in Dublin. This work was done over a period of three weeks in November/December and though it was subjected to graffiti, not all of it uninteresting, was finally defaced and destroyed. 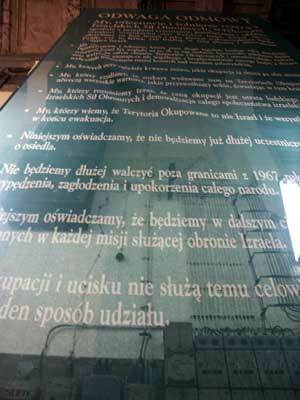 Most recently, and to date the most elaborate and most ambitious manifestation of the work has taken place in ‘Scheiblers Powerhouse’ as part of the invited International Section of the inaugural Lodz Biennale 2004, (Poland). In 2005, Shane has been invited, as part of Cork Caucus, to develop this project with the National Sculpture Factory. The movement and its founder were recommended to the prize committee by two Nobel Peace Prize laureates. Captain (reserve) Zonesheine, chairman and founder of the movement: "Our nomination is a victory of Jewish Values and a triumph of the Spirit of Democracy." "The movement's nomination for such an honourable prize is a decoration for the state of Israel. We are all part of a none compromising struggle for Israel's security and the safety of its citizens, yet at the same time we vow to prevent the loss of innocent lives, to guard human rights and the dignity of all those affected by the Israeli-Palestinian conflict. We will continue to protect the state of Israel, but refuse to fight beyond the 1967 borders, in the occupied territories" says Arik Diamant, the Director of Courage to Refuse. "Today the settlers of the extreme right threaten to violently resist the evacuation of the settlements. Our nomination marks the line that separates refusal to participate in illegal actions that contradict Jewish values and international law, from the refusal of those who seek to continue the occupation of another people". Courage to Refuse was founded in January 2002 and prides today over 600 reserve soldiers and officers, including air force pilots and commando unit soldiers. Over 200 of the movement members have been imprisoned for their refusal to serve in the occupied territories. Since its establishment less than three years ago, Courage to Refuse has become a highly influential public movement, and is today a leading power in the struggle to end the occupation and secure a safe, democratic future for the state of Israel. Courage to Refuse was founded following the publication of The Combatants Letter in 2002, by a group of 50 combat officers and soldiers. The initiators of the letter, Captain David Zonshein and Lieutenant Yaniv Itzkovits, officers in an elite unit, have served for four years in compulsory service, and another eight years as reserve soldiers, including long periods of active combat both in Lebanon and in the occupied territories. During their reserve service in Gaza, in the midst of the second Intifada, the two realised that the missions confided to them as commanders in the IDF had in fact nothing to do with the defence of the State of Israel, but were rather intended to expand the colonies at the price of oppressing the local Palestinian population. Many of the commands issued to them were, in fact, harmful to the strategic interests of Israel. Like all soldiers of the IDF, David and Yaniv were prepared to fight in order to protect their families back home. In January 2002 it became apparent to them that fighting in Gaza and in the West Bank would achieve the opposite result: by obeying orders they would not be protecting the lives of their dear ones. Although only young officers at the time, David and Yaniv understood what is today widely acknowledged by Israel's most decorated generals (including the current IDF Chief of Staff): The Occupation poses a threat to the security of Israel. Finally, it was the unbearable pain and suffering inflicted upon millions of innocent civilians in the name of the "settlements" that had lead them to draft one of the most shocking documents ever written about the IDF. Over the years, their statement came to be known as ‘The Combatant’s Letter’. In the letter, the soldiers pledge their ongoing commitment to the security of Israel, but declare that they will take no part in missions intended to prolong the occupation. To date, 635 combatants from all units of the IDF and from all sectors of the Israeli society have signed the letter and have joined Courage to Refuse. The members of the movement, often called "refuseniks", continue to do their reserve duty wherever and whenever they are summoned, but refuse to serve in the occupied territories. They are not considering their personal benefit, but rather Israel’s safety and its moral character. Over 280 Members of Courage to Refuse have in fact been court martialed and jailed for periods of up to 35 days as a result of their refusal. It was the selflessness and determination of the members of Courage to Refuse that won a warm place for the movement in the hearts of many Israelis. Their act of self- sacrifice, their willingness to serve prison terms in order to voice their cry of distress opened the eyes of many who have been morally blinded by fears and pain of war and terrorism. By and by, well-known public figures expressed their support to the members of Courage to Refuse. Hundreds of University Professors have signed support petitions and the word SERUV (the Hebrew word designating refusal), which a few years ago was synonymous with treason, has won its place in the Israeli political discourse as a legitimate and sound act of civil awareness. Sami Michael, the reputed author and the acting chairman of the Israeli Association for Human Rights has gone as far as saying that refusing the occupation is, in fact, not only an act of morality, but is also the purest form of patriotism practiced in Israel today. According to a survey conducted by Yaffee Center for Strategic Studies, over 25% of all Israelis sympathize with their struggle and acknowledge their civil right and moral duty to refuse to serve the occupation. Courage to Refuse accepts new signatories every week. Its members, beyond refusing to serve in the occupied territories, take part in many demonstrations, cultural events and other activities of public education aimed to end the occupation and bring peace to Israel. We, reserve combat officers and soldiers of the Israel Defense Forces, who were raised upon the principles of Zionism, sacrifice and giving to the people of Israel and to the State of Israel, who have always served in the front lines, and who were the first to carry out any mission, light or heavy, in order to protect the State of Israel and strengthen it. *	We, combat officers and soldiers who have served the State of Israel for long weeks every year, in spite of the dear cost to our personal lives, have been on reserve duty all over the Occupied Territories, and were issued commands and directives that had nothing to do with the security of our country, and that had the sole purpose of perpetuating our control over the Palestinian people. We, whose eyes have seen the bloody toll this Occupation exacts from both sides. *	We, who sensed how the commands issued to us in the Territories, destroy all the values we had absorbed while growing up in this country. *	We, who understand now that the price of Occupation is the loss of IDF’s human character and the corruption of the entire Israeli society. *	We, who know that the Territories are not Israel, and that all settlements are bound to be evacuated in the end. *	We hereby declare that we shall not continue to fight this War of the Settlements. *	We shall not continue to fight beyond the 1967 borders in order to dominate, expel, starve and humiliate an entire people. *	We hereby declare that we shall continue serving in the Israel Defense Forces in any mission that serves Israel’s defense. *	The missions of occupation and oppression do not serve this purpose – and we shall take no part in them. Oh but I forgot, Jews are not an ethnic minority and racism isn''t racism when practised against Jews. It is against everyone else, just not against Jews, especially in their native land.